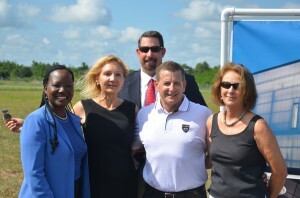 Moments after the groundbreaking of what may become a 200,000 square foot facility at the Flagler County Airport—and moments after he brandished the sort of aeronautical LED lights he specializes in, and that his wife first thought of as jewelry—Christian Nielsen, owner of Aveo Engineering, was off to hire his first employees. First of 50 this year, and 300 over the next three years. “We made a commitment here to not only change 300 lives but hopefully thousands more through the economic multiplier effect as we move to local sourcing for our product,” Nielsens said, speaking to an assembly of politicians from every local government and company executives, and with Gov. Rick Scott at his side. 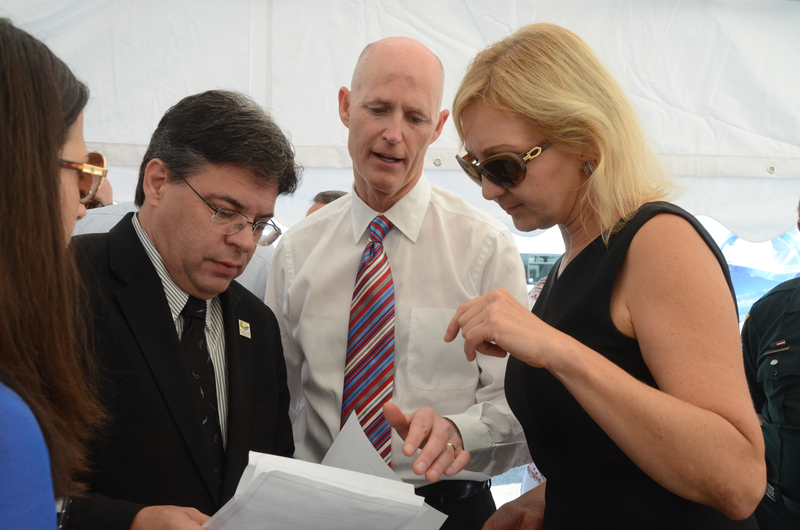 Scott was making his third visit of the year to Flagler, and second in 20 days, to tout the job gains. If those jobs are produced, landing Aveo Engineering in Flagler County will prove to be the largest single gain of private-employer jobs in memory: the last time local governments celebrated nearly as big a victory, in 2008, was when Palm Coast Data announced it was consolidating its multi-state operations into Palm Coast, promising to add 700 jobs to its corps of about 1,000 at the time. The new jobs never materialized, and the company lost many jobs since. The county’s economic development department, largely instrumental in securing the deal with Aveo, is projecting better fortunes this time. So is Nielsen, a brash-talking former Navy pilot who champions his products and the way he runs his business. “We’re privately held. I own everything. And we have zero debt. We pay for everything ourselves,” he said in an interview. “We’re not taking a dollar from anybody and we won’t take a dollar from anybody. We just do things. This afternoon, at 12 o’clock, I start hiring people, so this is real stuff.” The projected wage would average $43,000 per job. 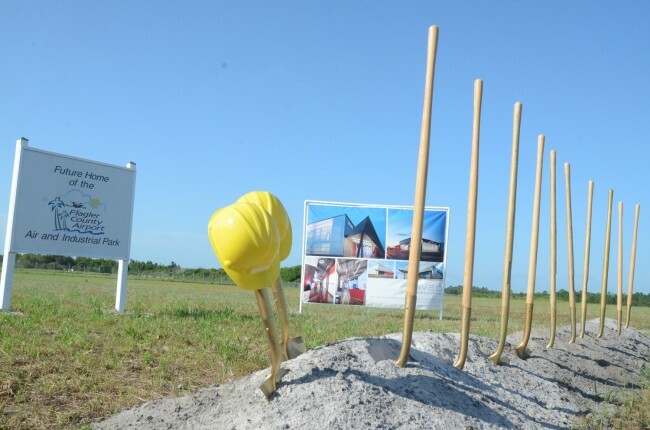 Craig Coffey, the county administrator, said the first Aveo building—the hangar the governor and others broke ground on this morning—will go up on one to three acres on the airside of the airport, and another will go up on five to 10 acres south of the hangar. Aveo will pay $1,050 an acre, per month. But the company will not pay rent until it gets its certificate of occupancy. “We’ve got a smaller amount up to that time, we may waive that, we’re working with them on the final details of that lease right now,” Coffey said. The Flagler County Commission approved the $150,000 incentive package, but has yet to see, or approve, the lease arrangements. 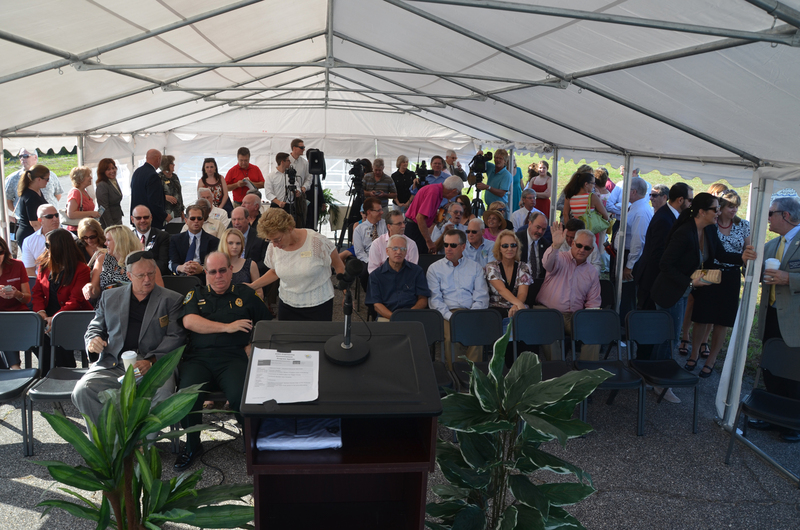 The cost of the incentives will likely diminish in proportion to the promises Aveo fulfills, especially if Nielsen’s vision for his Flagler County operation takes off. “This should become the epicenter of the company worldwide,” he said—an ambitious statement, in the context of current Aveo operations. The company has operations in the Czech Republic, a 163,000 square foot manufacturing facility in Slovakia, a 15,000-square-foot engineering center in Malaysia, a distribution office in Birmingham (Britain’s, not Alabama’s), and a programming office in Mumbai. The operation in Flagler will manufacture lights and fit and certify them on airplanes. “We have supply contracts beginning in the fourth quarter, so Oct. 1 we have to ship product from here,” Nielsen said. “Here we get to tap into the American work ethic. We’ve interviewed for the last two weeks here. The passion for opportunity here in the workers is phenomenal. The productivity of the American worker is head and shoulders above everybody else in the world. We’ll do the training here. I have 100 percent faith in the American worker that we’ll continue to outwork everybody else in the world. I launched my business in Europe because my wife is Czech and she didn’t want to leave her family.” Nielsen has a condo in the Hammock, but his home will remain in Czech. Few of those details were discussed during Tuesday morning’s invitation-only ceremony at the south end of the airport grounds, under a white tent that acted more like a hothouse than a coolant, judging from the rivulets of sweat on those attending, though the heat never dimmed the cheers. County Commissioner Nate McLaughlin was the master of ceremonies, introducing a governor still glowing from becoming a grandfather for the second time the evening before. Scott himself is running for re-election, as today’s appearance showcased: it was as much a job announcement as a stump speech before whirring TV cameras. But he’s also been looking for creative ways to avoid Tallahassee–and been criticized by the minority Democratic opposition for it–where the Dream Defenders, a small band of young protesters, have been camping out outside his Capitol office. The Dream Defenders are demanding that the governor convene a special session of the Legislature to re-consider Florida’s stand your ground law. After Flagler County, Scott was off to Orlando for a similar media-rich announcement involving new jobs produced by the Golf Channel. 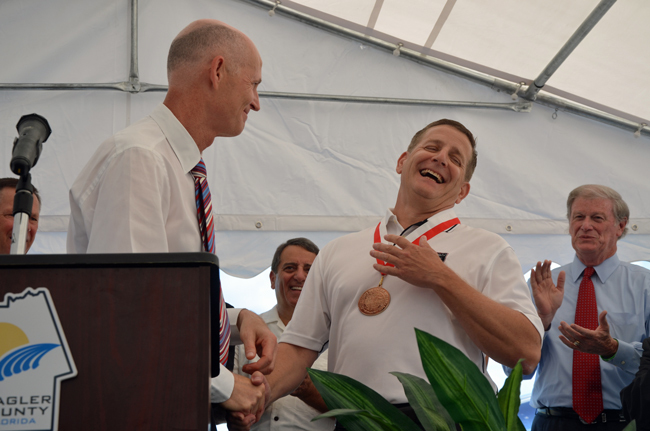 In Flagler, he called Nielsen “a true example of the American dream” and gave him the Governor’s Business Ambassador award, a large medal that he put around Nielsen’s neck. The governor recognized the originality of Aveo’s product. As is usually the case on such occasions, and aside from the business figure at the center of the new enterprise, the grunts who put the deal together were only recognized in passing by name, but were not given a chance to speak: Coffey, Roy Sieger, the airport director, and Helga van Eckert, the county’s economic development director, for whom the Aveo announcement is the fifth significant success in less than two years. She and Coffey would have had a sixth—a pilot-training program based at Sanford Airport that would have bought 1 million gallons of fuel a month (compared to the 250,000 gallons bought currently), and reportedly brought 80 planes to the airport. But an Air Force officer visiting the airport did not like future improvements in the works, as designed, and the deal fell through. Barbara Revels, the county commissioner and chairman of the county’s jobs council, was last to speak before the shovels flew. It was then up to Scott to give staging directions to the shovelers: the governor, with a shovel of his own, told the officials on his flanks how to look for the cameras, and when to look it, as they went through the motions of overturning the pile of dirt prepared for them. All five Palm Coast City Council members were in attendance, though the city had little hand in the deal. What kind of jobs will be started???? Is this going to be openings for everyone or just people that went to collage? If we the local existing businesses will be receiving our government tax payers funded contracts other than being awarded elsewhere, over baseless frivolous excuses, with just that, we will be able to create hundreds and or thousands of jobs without having to come up with tax payers moneys for perks in these new pay up front for promises for future jobs creations. Is the game of tell me Who you are and I will make sure you get tax payers $$ for your private enterprise wether a scam or not. Good luck! Enough of the goof balls from tallahassee. You didn’t build; it but oh the photo op. Flagler county is ignored by tallahassee …… yep you too senator……. great photo op you guys couldn’t ignore. Well done by all. Glad to have these folks here. Great job to the folks in Flagler County govenment. How many employees is the owner bringing with him, and are they the high paying jobs? What are the rates of pay of those hired today? If the county got burnt on the Ginn deal, why offer he same kind of deal? If it sounds too good to be true, it probably is. I hardly see how this is actually going to help Flagler County’s job market. Unless they actually have a job fair and hire applicants that live in Flagler County, this is nothing more than another dog and pony show by Governor Scott and his Flying Circus! I certainly hope this more than a dog and pony show for a Scott photo op. Hopefully Flaglerlive will do a follow up and let us know just how many folks from Flagler county are hired by this company. . .if fortune smiles, there will be many. I am happy to have my tax dollars support this kind of endeavor as long as it “really” creates long termed, well paying jobs for “local” residents. Where do we go to apply? Wishful thinking, but fear it’s the old snake oil sale. Come to town, set up a cart, add some “key” players in the crowd, then sell. How often does the Governor go to a ground breaking, he didn’t even go to the speedway for their million $ remodel (& they didn’t get the incentives either). If they’re using their own money, why take incentives or money from the STATE and county. Sure, the county isn’t out but some lease money if they don’t pull it off, but what about the state’s? The county is so gullible, funds are foreign and this co knows no one is going to their locations abroad to check out, so rent a local warehouse for the “appearance” of local. Trickery of the words, what they’re (silently) saying is the product is just shipping from here, not being manufactured. It would be a miracle to have building & equipment done in 3 months. Hope for the best, but been down that road with Ginn & others. Just an ‘ol timer’s experience. FlaglerLive, should’ve done more digging, but guess it’s old news. Time will tell. Welcome Aveo!!! Please ignore the negativity. They are the minority in this town. Let’s get to work!!! !